So what makes a Parker House roll special? Butter. A buttery fold during the shaping process (and butter brushed on after they're baked) give them over-the-top flavor. 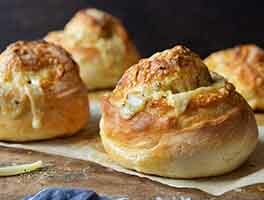 An egg, milk, and a fair amount of butter in the dough give them fine and tender texture. All in all, this Boston-based roll is a bread-basket classic. One more note: the "original" Parker House roll recipe calls for the dough to be cut in circles, dipped in butter, and folded over. However, having tried this rather messy process in the past, and ending up with rolls that popped open in the oven, rather than hold their shape (and their buttery pocket), we opted for a slightly different method. The result? Softly rounded rectangular rolls, looking very much like the rolls served these days at the Omni Parker House hotel — still a Boston landmark after all these years. 2 hrs 55 mins. to 3 hrs 25 mins. In a large mixing bowl, or in the bowl of an electric mixer, combine all of the ingredients (except the 3 tablespoons melted butter at the end), mixing to form a shaggy dough. Note: to speed the rising process, whisk together the milk and egg, and heat gently just enough to remove the refrigerator chill; then add to the remaining ingredients. Knead the dough, by hand (10 minutes) or by machine (7 to 8 minutes) until it's smooth. Place the dough in a lightly greased bowl or 8-cup measure (so you can track its rising progress). Allow it to rise for 90 minutes; it'll become quite puffy, though it probably won't double in bulk. Note that the dough takes quite awhile to get going; after 1 hour, it may seem like it's barely expanded at all. But during the last half hour, it rises more quickly. Transfer the dough to a lightly greased work surface. Divide it in half. Working with one half at a time, roll or pat the dough into an 8" x 12" rectangle. Brush the dough all over with a light coating of the melted butter. You'll have butter left over; you'll need it for the other half of the dough, as well as for brushing on top of the baked rolls. Cut the dough in half lengthwise, to make two 4" x 12" rectangles. Working with one rectangle at a time, fold it lengthwise to about 1/2" of the other edge, so the bottom edge sticks out about 1/2" beyond the top edge. You'll now have a rectangle that's about 2 1/4" x 12". Repeat with the other piece of dough. Cut each of the rectangles crosswise into four 3" pieces, making a total of 8 rolls, each about 2 1/4" x 3". Place the rolls, smooth side up, in a lightly greased 9" x 13" pan. Repeat with the remaining piece of dough, making 16 rolls in all. You'll arrange 4 rows of 4 in the pan, with the longer side of the rolls going down the longer side of the pan. Gently flatten the rolls to pretty much cover the bottom of the pan. Cover the pan, and let the rolls rise for about 45 minutes to 1 hour, until they're puffy but definitely not doubled. Towards the end of the rising time, preheat the oven to 350°F. 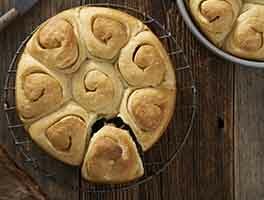 Bake the rolls for 20 to 25 minutes, until they're golden brown and feel set. Remove them from the oven, and brush with the remaining melted butter. Pull them apart to serve. Due to the natural tendency of yeast dough to both stretch and shrink as you work with it, don't stress when you don't end up with rolls that are all the same size. Just arrange them however they best fit to cover most of the bottom of the pan — a shorter one next to a longer one, etc. By the time they've risen, baked, and been slathered with butter, no one will care about perfection, size-wise. And anyway, as Ralph Waldo Emerson said: "A foolish consistency is the hobgoblin of little minds." Is this suppose to be a drier dough than most? Followed as written, however no rise at all within the first 90 minutes. It was a hard ball of dough so had to toss because was Christmas day and needed to move on to plan B. It was chilly in the house so that may have contributed to lack of rising. I will try again another time and see how it goes. If successful I will update my review and comments! Made these for Christmas dinner. AMAZING! Will definitely make these again. I wanted to reply to Susan from Boulder CO (12/21/2018), check that the yeast hasn't died. If it gets too old, or if the conditions are too humid, it might have expired. 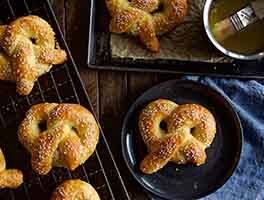 For this recipe, it is my go to for bread. I do change it up a little bit by adding finely crushed almonds. Kinda like almond powder, but with enough chunks of almonds to give texture to the added taste. Also, I make this recipe in a loaf style... easier to give to friends and family as a present. Question: Followed the recipe exactly, except adjusted for high altitude per your "Tips." Very little rise in the dough; finally got tired of waiting (2+ hours), shaped, but no rise in the pan, either. Flat as pancakes. Used new yeast, KA AP flour ... ???? My Grandmother made the round Parkerhouse version in the early 1940s. I watched her as a 5-year-old and was delighted by the bit of butter inside of each one. She called them "Pocketbook Rolls." This recipe is THE BEST! I live in Denver (high altitude) and the only adjustments I made both times I've baked them is to add a touch more milk. I don't add anything until I can see how the dough looks while kneading in the stand mixer. So far, I've used the dough for rolls and to make bierocks. Really a fantastic and versatile recipe. 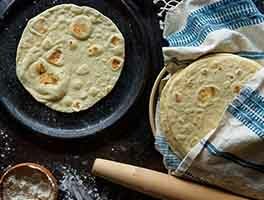 This recipe is fantastic!! I'm not a baker and tend to shy away due to all my flat, dense breads and many flops! 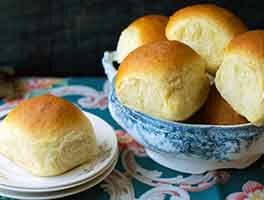 About a year ago I tried a different recipe for Parker House rolls and they were terrible! On a last ditch effort to redeem my baking skills I tried one more time using this recipe. They came out perfect and I've been making them ever sense! 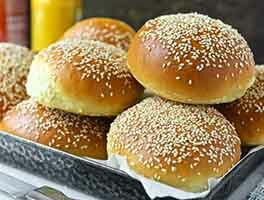 Even my son who is a super picky eater and a bread connnoisseur loves these rolls! They were the hit of the after dinner turkey sandwiches this Thanksgiving! Everyone loved them!! Thank you for re-energizing my attempts at baking! I made these rolls last night and they were perfect. I used the dough hook on a kitchenwid mixer and the dough came together in 7 min. For both rises I did something that's not in the recipe I put a bowl with 3 cups of boiling water in the base of the oven (which was turned off) for both risings. It worked great always does.